I have finished to translate and update the reviews of some of my fountain pens. Next months I will add more photos and I will write more reviews. The M1000 has been my dream since I bought my first Pelikan, but I have always been stopped by its prohibitive price. I was always attracted by the combination of big nib, big size, pen lightness and internal solid brass mechanism. Whereas it is the Pelikan Souverän series flagship it has been paid very low on ebay and the shipment from a german private person was fast. The package was perfect but the pen, not being sold by an official dealer, was provided without the deluxe package which would have had a TG1 ink bottle with pen rest, in addition to the included standard soft cardboard box with the hard cardboard inside. Inside the box there was not even the instructions/maintenance/warranty booklet and to my request of explanations, the seller quickly told me that I had a warranty of 1 year with him but at the 99.999% I would not have needed of it. However, the pen was a gift from my girlfriend and never look a gift horse in the mouth. The initial impact was very exciting for me and today I am still surprised by many of its characteristics and when I hold it in my hand I always feel good. As for all other Pelikan pens owned by me, also this pen is perfect or it is perhaps even more better being the Souverän series flagship. The pen is in the classic version with semitransparent green stripes, black resin for handle, knob and cap and 23Kt gold-plated trims. It’s completely diamond polished and has no smearing of any kind even though the green rows are not perfectly parallel to the pen axis. I am very satisfied with the overall quality of construction that obviously was not clear from the photos. The pen is in a diamond polished acrylic. 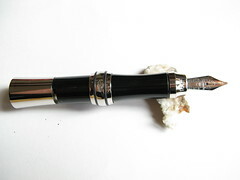 The shape is the Pelikans’ classic cylindrical shape with rounded ends and on the cap tip there is the golden Pelikan symbol. The clip is shaped like a pelican beak with eyes close to the cap tip. Both at the base of the cap and at the base of the plunger knob there are 2 gold-plated bands which give even more emphasis to the majesty of this pen that live is much more beautiful and enjoyable than I could expect. The pen is over-sized and infact it is long 146 mm capped, 135 mm uncapped, 177 mm posted, while its weight is of gr. 33.3. The cap alone measure 70 mm. The diameters are: 12 mm for handle, 14.5 mm for body, 15 mm for cap. Having small hands the pen is more comfortable uncapped for me but it can also be used posted without compromising the balance. The maxi nib is 18Kt solid bicolour gold and its stroke is Medium. I chose Medium because with the M200 I experienced that with Fine the ink lasts for too long and in this way I have more opportunity to experiment with new inks or get rid of one if I am bored of it; infact you have to consider how much ink can be hold in this pen, I like change ink from time to time, and that I have large stocks of Pelikan 4001 Brilliant Black. However it seems slightly larger than M150 medium. It’s absolutely rigid and runs well on any type of paper. The flow is slightly abundant but not so much to bleed through the Quablock by Pigna paper sheet, just as much for what is necessary to use blotting papers when you turn the sheet if you do not want to wait that the ink dries. 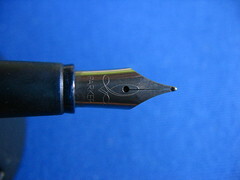 The feed system is a classic Pelikan with horizontal plastic strips that, whereas the nib size, are many and thin. Everything is easily unscrewable for replacements, repairs, or for easier pen cleaning. As pen for greeting cards, for letters and diary I am very pleased because even though the nib is big it is very comfortable. Unfortunately in Moleskine the amount of ink that comes out from the nib slightly bleeds through the sheet and has also a little feathering effect. Instead it is perfect with Ciak paper. 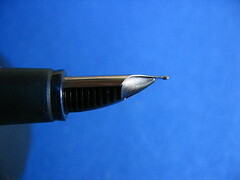 The nib measures are: length 26 mm, wingspan 9 mm. The M1000 has a classic filling piston system but its peculiarity is almost invisible from the outside and it’s that all components are made of solid brass and are virtually indestructible. The pen ink capacity is significant also if you remove the classic three drops after initial filling, but given the medium-broad nib and the flow a little abundant, the ink doesn’t really last for too long but as I have already written, it is a solution that I have personally selected and then I am satisfied with it. I think that the plunger moves really well without any problems and it is interesting to see quickly and significantly decrease of the ink bottles level when the pen is being filled. Although the pen has been donated to me for my birthday by my girlfriend, I know that its price was € 225.00, bought on ebay from mundo_handel, unofficial dealer that provides a one-year warranty with him. The purchase was made on June 12nd 2008, with € 15.00 for shipping costs. I think it’s odd that Pelikan does not provide a lifetime warranty for its Souverän series flagship pen. Other brands do it for their flagships thence giving more value to the pens especially in the large collectors’ market. My girlfriend felt very good as buyer with mundo_handel and I think that she did a good deal whereas the pen has an official almost double price. I think the M1000 will remain the flagship of my pen collection, not only because I have always dreamed of it and it was a gift from my girlfriend, but also because it was much better than I expected, unlike other pens of superior cost. For someone the green striped color sounds a little bit vintage but I really like it because of semitransparent effects that permits almost to see the mechanism and the ink. The Pelikan site is unable to convey the emotions that you feel holding this pen, not even with pictures of the black version. I know that there is also a version with silver trim and cap and is called the M1050 but I wouldn’t like it because as I have seen with other pens, silver, becoming dark and oxidized, will ruin the aesthetics. I suggest to buy the M1000 for sure, especially if it is still at this price. This pen has convinced me on two points, yet still valid for me: the high quality of all level Pelikan products and the incredible versatility of the piston filling system and its low cost compared to the cartridges. Then I was attracted by this pen because of three features: the brand that was not still tested at the time, its cost and the filling system. Unfortunately it was not so easy to find it because dealers in my city don’t sell it because it is an entry-level model. So I bought it online after reading several positive comments on FPN. The soft cardboard carton box, with the traditional hard cardboard box inside, had all the original Pelikan symbols and the booklet contained in addition to the warranty instructions, even the pen loading and maintenance instructions. Although it’s the basic modern model of Pelikan piston filling pens, the quality of this pen, talking about assembly and finishing, is absolute. 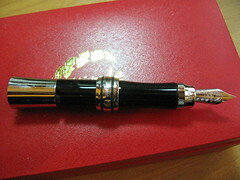 The pen is glossy black with gold plated trims and exists only in this coloring. Observing closely the pen it doesn’t have any imperfection either in body, in cap and even in the nib, as to emphasize that Pelikan has the same attention to quality both for the cheaper and for the most expensive models, which price is due to their design, construction materials and limited edition production. I was certainly impressed by the pen even considering the online photos of the pen that have never been great, perhaps for the fact that was not convenient to take spectacular photos of a cheap model. 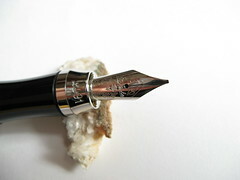 The pen is completely in black smooth diamond polished acrylic. It has a classic cylindrical shape with slightly curved ends and the cap tip has the traditional golden pelican. 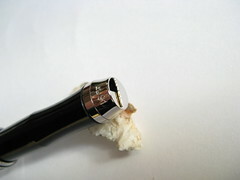 The clip is shaped like a pelican beak with eyes at the beginning, like in all Pelikan pens. 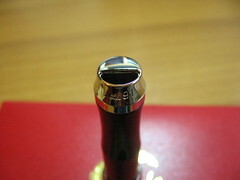 The pen is very thin and small-medium lenght, so it is perfect for carriage being pocket-size. Its lengths are: 120 mm capped, 116 mm uncapped, 142 mm posted and 53.5 mm the cap alone. The diameters are: 12.5 mm of the cap, 11 mm of the body and 9 mm of the grip. Finally, the weight of the pen is gr. 12.5, that for someone it may seem low, but you get used easily to it. 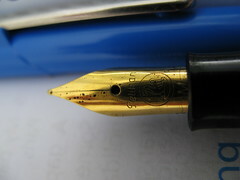 The small steel nib is gold plated with a length of 18.5 mm and wingspan of 6 mm. The stroke is Medium, chosen because it is more common. I was expecting an everyday easy writing and it was. Compared to other medium is actually a real medium, and it runs very well on any kind of paper even though at the beginning it was a little scratching. The ink flow is steady and regular enough to allow quite long pauses without risking to let dry the ink and without inundate the paper, creating transparency effects. The feed system is in plastic with horizontal strips, a classic of Pelikan pens. The nib is screwable and replaceable and this results in a considerable easy maintenance of the pen. I am very pleased with the nib quality and this has prompted me to medium and high level models. The pen has a classic piston filling system, with the mechanism and components in plastic and a semitransparent green window for assessing the ink level when it is out of the end. It has no reserve system but with the small nib and the smooth plastic grip, it’s easy to refill it even “on-the-go” with the Stipula Netto Netto inkwell or with the Visconti Travelling Inkpot. Considering the classic three drops the pen can hold as much ink that in an everyday use it does not last long but it allows an easy transport. 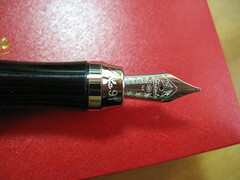 I bought the pen on March 13rd, 2006 from http://www.eprice.it at the price of € 39.32, which in fact was the suggested customer list price from Pelikan. Recently I have taken the same as a gift for my aunt in Cagliari at Cartoleria Dettori at the price of € 40.00. Apart from the not updated prices of the city dealer, its value should be slightly increased but not so much as it’s just an entry-level. For my pen, the warranty is no longer valid, because it was for 3 years. The FPN reviews well described the merits of the pen and I also agree saying that the paid price is good and you realize it only with an everyday use of the pen. From what I understand, it is the evolution of the M481 that I bought later but I consider that less beautiful than M150. If you are looking for a pen, small and handy, pocket-sized, with no frills, of good quality, this pen is for you but only if you love the piston filling system. Whereas my full experience with Pelikan, at present I would buy at least a M300, but this remains my first real Pelikan. I chose to receive this pen as an university degree gift of the last year for the following reasons: it’s Italian and like all high-quality Italian things with time it acquires value, it’s a technologic pen with its retractable rotary mechanism, it’s small and it’s standing perfectly fine to leave on the desktop, it’s elegant and it’s something that lasts over time being totally metal. I saw it for the first time at Giardino Italiano site where later it was bought at and then I read a review about it on FPN. As always, Giardino Italiano has been reliable in the shipment and the package contained a Visconti Opera Club (of which I will write the review soon), several ink cartridges and it should also contain an inkwell with aluminum cap, kind gift of the site, which it was sent later with other inkwells I purchased. The pen arrived with the classic red box with hidden drawer which contained the instruction booklet / maintenance / warranty and 2 Stipula Blue della Robbia cartridges. The pen is pretty solid and compact because of it is almost completely of metal. The body of the pen that is also the grip is covered in shiny plastic, the rest is just metal chrome. It’s a bitonal black / chrome, perfect in detail and finishes. Of course all these shiny surfaces suffer of the hand sebo. In photo the black seemed dull, but in this way it’s much more elegant and I am very satisfied. The pen is completely metal and this obviously affects the weight that despite its small size is gr.59. The grip diameter is 13 mm. The whole design of this pen is special and unique, hard to describe but this design allows the pen to be stably positioned vertically when not in use, while maintaining a sleek line and securing the nib with a patented retractable mechanism system. When you use the pen the flat base shows the visible symbol of Stipula nib while around the nib the metal is engraved with “La 91” which is also the length in mm of the pen when it is closed while when it is open it measures 112 mm. Although the balance of the pen is perfect, its weight is felt and then relegates the pen for sporadic use only i.e. for signing documents or for short letters. In any case, photos do not make justice to this jewel. The nib is a rhodiated 14kt solid gold with Italic 0.9 line, its length is 21 mm and the wingspan is 8 mm. Since the first use with the FPN Bexley I always liked the italic stub nibs so that if the pen is of high quality I always try to get it. I have another Stipula with italic nib but it is 1.1 and I still have to write the review. The stroke is soft and smooth and the nib is of the hard type. It keeps very well the ink that hardly dryies even though the flow is not particularly abundant but it is such to make a good shadow effect with the Stipula Terra di Siena ink. Unfortunately due to its small size, the feed plastic system can not be unscrewed but can only be jointed, which I haven’t checked for obvious reasons. The line is great with the Stipula Terra di Siena ink on all types of paper tested. The small size and the bayonet mechanism have constrained designers for use of short cartridges exclusively, and when the pen is closed, they arrive almost at the base and then the pen is incompatible even with the smaller converter. I usually prefer the piston filling system but considering that the pen is meant to be used occasionally and looking at its beautiful design, I am fully satisfied with this system that, unlike other pens, let the ink dry very slowly allowing the use of a mounted cartridge even after several months of time, preceded by a quick nib immersion in distilled water to dissolve just the dryed ink on the tip. Only drawback: it is very difficult to clean. Apart from the fact that the pen has been selected by me as an university degree gift from my aunt, I recommend strongly the purchase because it is out of production and then entered the firmament of rare pens. On September 4th 2007 the pen was paid EUR 215.00 from Giardino Italiano, official Stipula distributor and retailer. The pen was obviously new and perfectly packaged in its original box with lifetime warranty. I am always satisfied with my purchases at Giardino Italiano, and about the excellent assistance of Susanna and Marcello. It is strange that a pen so beautiful and special has been publicized not so much. I am very happy because it actually respects the requirements for which it was designed: to catch the eyes of those people around us, to always be near hand, and to write well without too many thoughts at the ink. It’s a sin only for the cleaning difficulty but it’s an acceptable problem due to its design. This pen will remain one of the best and most unique pens in my collection, even if in future there will be more rare and expensive pens. 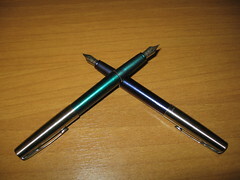 From what I read on Giardino Italiano and FPN it seems that in 2009 Stipula will release a new version of the pen, not only a simple nib change from titanium to gold as it happened in the past. At this point I am very curious, who knows if I will have the opportunity to have one of them in the future, to place side by side to this version. Before I decided to collect fountain pens also of a certain value, I was willing to stay in the medium-low class pens and this model is considered the entry-level model of Parker brand so I looked for a few seller on ebay and I was attracted by either the low price and the Iridescent color that in some photos made up the pen color purple. This pen is one of the first purchased on ebay, practically the beginning of my collection. Despite coming from Great Britain the shipment was fast and arrived packed in padded envelope with its original packaging in plastic blister with cardboard. Inside there were the classic Parker Sapphire cartridge and package of the lifetime warranty and instructions. As you can imagine, being a cheap pen, it is built in series in large numbers and so it is difficult to find any defect that does not belong to the whole series. The pen has a metal satin cap, plastic body with iridescent blue-violet effects and a rubber blue-purple handle. Watching carefully, the pen is almost perfect seamless symmetry. The only flaw in my opinion is that the cap remains not so tight when the pen is capped but this does not seem to affect in any way the ink flow in the nib. Considering the price I am quite satisfied with the appearance of the pen. The pen is in plastic and metal and it has a cigar shape is a cigar with a flat end cap. The clip is a classic arrow-shaped Parker. The shape is comfortable and perfect for a battle field or street pen. The measure is a regular or medium-regular, according to various opinions. It ‘s very light, infact it only weighs gr. 15, which may be disturbing to someone, but that makes it attractive as an every day pen. Having the pen posted or uncapped will change little as the weight is so low. The dimensions are in mm: capped 133, uncapped 123, posted 149, body 76, body diameter 12, cap 56, cap diameter 13, grip 48, grip diameter 11, nib 18, nib wingspan 8. The medium nib is dark polished steel and is a real Medium. The nib writes well but not perfectly smooth, which is quite normal considering the cost of the pen. It’s rigid and the flow is perfect even allowing long pauses with no obligation to cover the pen. The feed is made of plastic with sided strips, it’s screwable and replaceable and, in some cases, interchangeable with those of the Sonnet series. It doesn’t skip but over some papers is a little rough. Overall I am very satisfied. As all the entry level low cost pens, the filling system is always a cartridge also if the pen is able to accept any Parker or Aurora converter (not supplied). Parker and Aurora cartridges , that exist only in long version, are quite comfortable and allow an economic use of the pen by buying compatible cartridges. Just pay attention to ink quality. I paid the pen € 6.00 + € 3.00 for shipping costs and at the time of purchase its value was € 15.00. I bought it on ebay from sheildcosmetics and despite being a private, the pen has a lifetime warranty, but obviously without proof of purchase. I got it still sealed with its transparent and card-blistered box. For what I have written I can say that I have well spent my money because in Italy this pen is not easy to be found. In any case it is part of a low level class in my collection. I have nothing to complain even for the transaction on ebay. Overall, the pen is very good, though in the long writing period its lightness may tire. Many people find the Frontier’s writing better than or equal to the Sonnet’s one. Personally I find it slightly more rough, although there are several versions of Frontier and perhaps the most expensive ones could be better, but I think the change is only about the finish and the material of the pen. Surely I suggest the pen to all those people who want a pen that writes well, is convenient and cost so low that you can carry around and use it in any situation without risking a heart attack showing, losing or breaking it.